His Holiness the 14th Dalai Lama with Middlebury President Ron Liebowitz on the stage in Nelson Recreation Center. 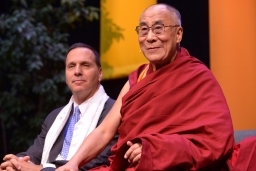 Senator Patrick Leahy introduced His Holiness the Dalai Lama at his Oct. 13 talk. Donning a Middlebury visor, the Dalai Lama greets the crowd of 2,800. President Liebowitz and College Chaplain Laurie Jordan greet the Dalai Lama prior to his talk. Following his talk, the Dalai Lama consecrated a tree planted in his honor near the Davis Family Library. Oct. 13 Update: On the second day of his two-day visit, His Holiness the Dalai Lama spoke to another sell-out crowd at Nelson Recreation Center, this time to members of the larger community. Following a welcome by President Ron Liebowitz, Senator Patrick Leahy, a longtime friend of the Dalai Lama, introduced His Holiness. "When we speak of peace, it is His Holiness we speak of," Leahy said. In a talk entitled, "Finding Common Ground: Ethics for a Whole World," the Dalai Lama noted that in the last century, 200 million people were killed in violence around the world, and he urged that the 21st century must be the century of dialogue. With playful laughter and without the slightest hint of ego, one of the most recognizable people on the planet His Holiness the 14th Dalai Lama made his third official visit to Middlebury College today, Oct. 12. Inside a former hockey rink filled with 2,800 excited students and community members, the spiritual leader of the Tibetan people and recipient of the 1989 Nobel Peace Prize shared his message of cultivating hope, wisdom, and compassion. He spoke to the audience in English for 35 minutes, standing on stage for the entire time and without ever glancing at notes. Then he sat down on a couch and answered seven questions for about another 50 minutes. The uplifting tone of the event was set early on while the Reverend Laurel E. Jordan, the college chaplain, was giving her prepared introduction for the 77-year-old honored guest. She was barely two sentences into it when she let out a sudden “Oh, my gosh!” and stepped back for a moment. The Dalai Lama surprised her (and the entire audience) by coming out early with the college president, Ronald D. Liebowitz, at his side. After the chaplain and President Liebowitz finished their introductory remarks, the Dalai Lama was handed a blue Middlebury College sun visor, which he pulled on with a mischievous grin, and stepped to the microphone. The world can solve its problems through peaceful means and “that way we can build a century of peace.” The key to accomplishing it, he said, is by developing “a sense of concern for the well-being of others” and setting aside “self-centered attitudes.” He encourages individuals to show a “genuine sense of respect” for other people because that leads to meaningful dialogue. This generosity of spirit and open-mindedness was central to the Dalai Lama’s message of cultivating hope, wisdom and compassion. Then he drove his point home: “You can kiss the diamond ring, but it’s not going to show you affection.” But if you kiss or cuddle a kitten or a dog, “it will show you affection. For living things, affection is what’s most important.” The happiest people are the ones who received the most affection from their mothers, he continued. Wealthy, successful people may be outwardly happy, but deep inside they are unfulfilled. It is hypocritical of people to think that money or success will make them happy, he said. “So I prefer these animals,” he said—meaning cats and dogs and, by extension, kindhearted people. “Friendship is entirely based on trust, for without trust there is no friendship,” he said. Bringing his remarks back to education, he said that education should give equal weight to teaching “external comfort” and “internal comfort.” “That’s why I call it educating the heart,” he concluded. The Dalai Lama touched briefly on the events of 9/11 and the subject of secular ethics, and frequently returned to his message of compassion for all people on earth. As he answered questions that had been submitted in advance, the man believed to be the reincarnation of the Buddhist bodhisattva of compassion appeared to tire. He tried his best to answer some of the more complex queries, but his proficiency in English occasionally let him down. Yet for someone who is not a native English speaker, and with the assistance of his long-time interpreter, Thupten Jinpa, he did marvelously well giving long and detailed responses. That’s why when he answered the question “Are both people of faith and people without religion equally capable of cultivating hope, wisdom and compassion?” in just five words—“Oh yes! There’s no question”—the gathering broke out in laughter and applause. Then he moved on to the next question, grinning broadly under his new Middlebury hat.